Qantas will refocus its service between Australia and New Zealand to allow greater flexibility to adjust capacity during shoulder and low seasons. While relatively straightforward, Qantas has not previously done this. 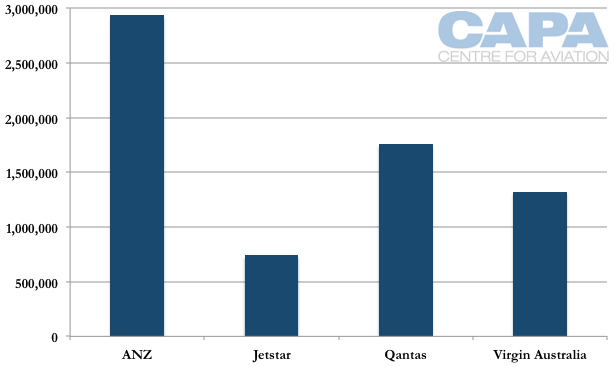 Qantas in 2013 adjusted monthly seat capacity by -9% to +7% while Air New Zealand adjusted capacity by -19% to +16%, Jetstar by -22% to +22% and Virgin Australia by -15% to +10%. Air New Zealand has been rewarded with consistently high load factors while Jetstar and especially Qantas have performed weakly in off-periods. There is now an opportunity for closer integration between Jetstar and Qantas. Virgin Australia has had the weakest load factors, perhaps suggesting its move to a premium positioning is not commensurate with its core trans-Tasman leisure traffic. It too may need to revisit its approach. Air New Zealand is the largest carrier between New Zealand and Australia, with 67% more seat capacity than the second largest carrier, Qantas. The Qantas Group, comprising Qantas and Jetstar, offered 2.5 million seats in 2013 compared to Air NZ's 2.9 million, according to BITRE. Air NZ and Virgin Australia have a joint venture across the Tasman that offered 4.2 million seats in 2013 to the Qantas Group's 2.5 million. Qantas also has a partnership with Emirates, which flies multiple trans-Tasman routes for local traffic (it has uplift rights) as well as to link New Zealand with its global network. However, these statistics, like other fifth freedom operators, are not complete and so are not included. Further, the focus of this analysis is on how major carriers adjust to seasonal trans-Tasman demand, nuances that impact point-to-point operators more than fifth freedom operators. A Qantas Group statement announcing the changes make numerous references to Qantas being more agile across the Tasman: "Qantas and Jetstar have published a number of changes their trans-Tasman schedules, designed...to better reflect seasonal peaks. Rather than the flat, year round schedule it offers now, Qantas will move to more dynamic scheduling across low season, shoulder periods and peak seasons on the trans-Tasman." 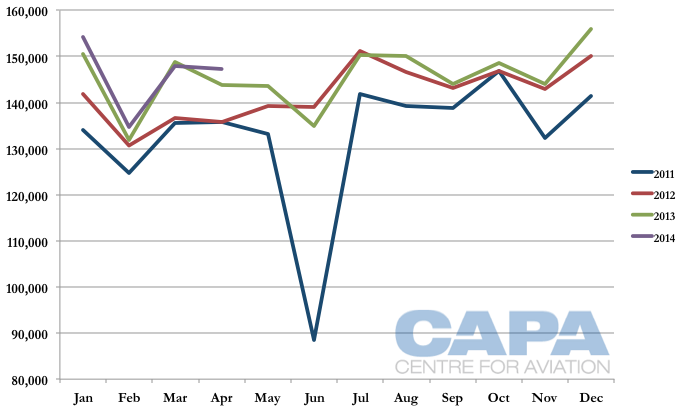 Qantas in 2013 adjusted monthly capacity by -9% to +7%. Air New Zealand in comparison adjusted capacity by -19% to +16%, Jetstar by -22% to +22% and Virgin Australia by -15% to +10%. Qantas' competitors, as well as its wholly owned Jetstar LCC subsidiary, have meanwhile been agile, matching capacity to demand. Although more involved and intricate, the move obviously delivers financial benefits. Or viewed another way, Qantas' relatively flat trans-Tasman network is perhaps another sign of the legacy practices it is only now shaking off. At home the announcement was seen with some negativity even though the implication of agility was clearly a positive. 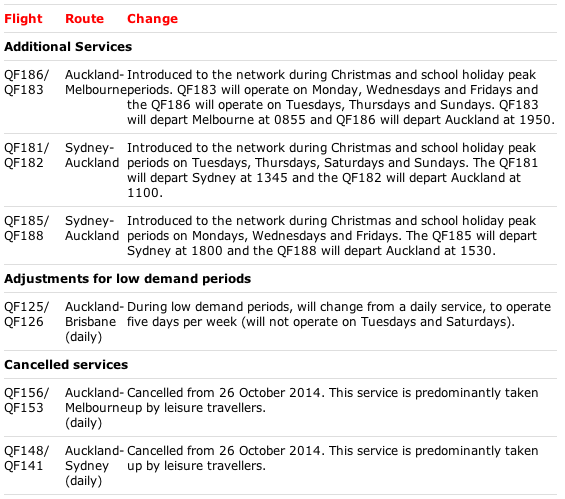 Trans-Tasman adjustments follow overdue changes to Qantas' international (Asian) network. Qantas in the last three years has generally deployed capacity consistently year-on-year, with an exception in Jun-2011 when an earthquake struck Christchurch, dampening demand, while an ash cloud forced cancellations. 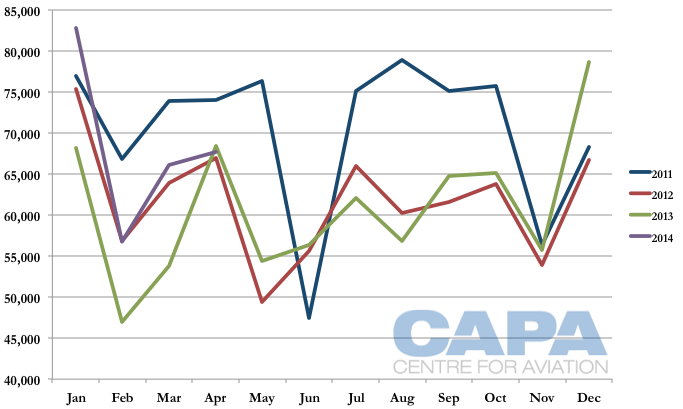 Qantas in 2012 grew capacity throughout most of the year while 2013 experienced growth in mostly the first half of the year and then peak Dec-2013 travelling season. 2014 data through Apr-2014, the latest available, indicates relatively flat year-on-year capacity deployment. 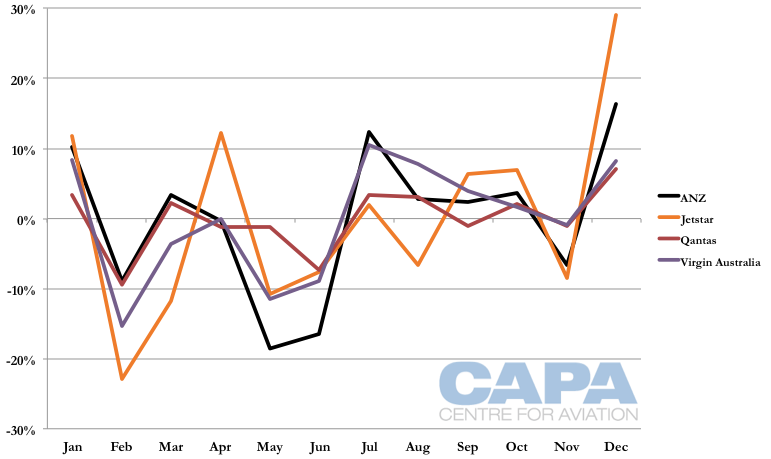 Jetstar has changed year-on-year capacity levels more significantly as well as adjusting monthly capacity to respond to peaks. Jetstar's seat capacity in 2012 (741,000) and 2013 (731,000) was lower than in 2011 (845,000). 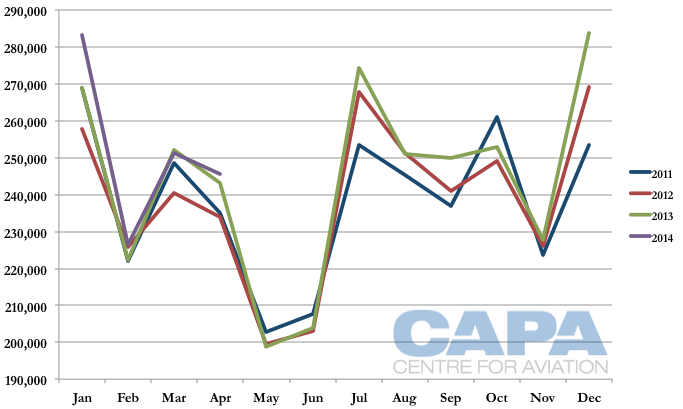 However, capacity data for the first four months of 2014 shows the figures above 2012 and 2013 but still below 2011. 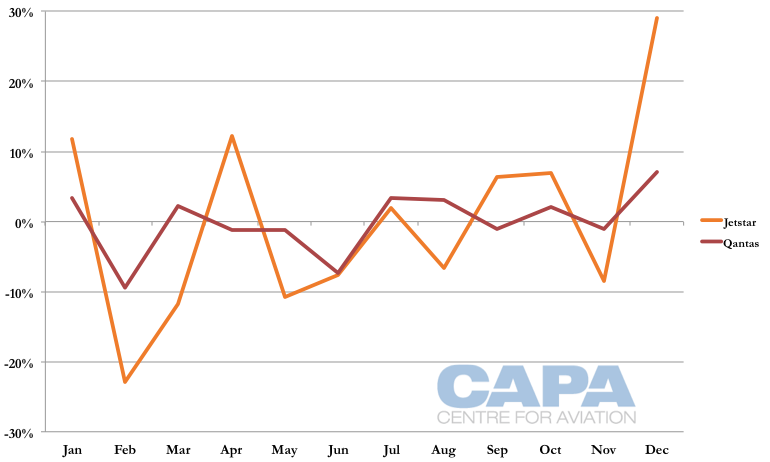 Jetstar capacity has peaked according to leisure demand: increasing in December and January around summer and Christmas/New Year holidays, again in April for Easter and short school breaks and then again in July for winter school breaks. 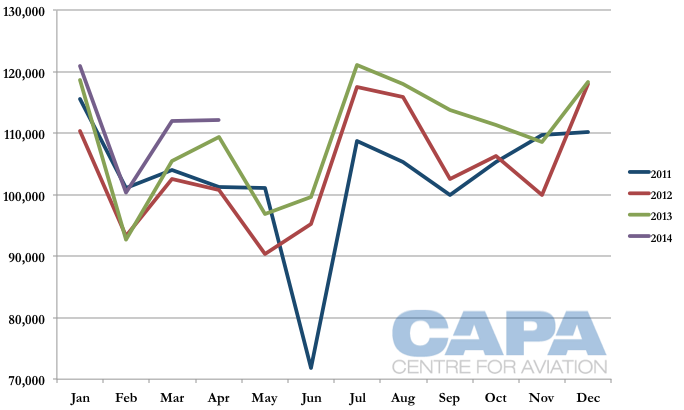 Air New Zealand has been very consistent with its capacity year-on-year. Its 2.86 million seats in 2011 were followed with 2.87 million in 2012 and then limited 2% growth to 2.93 million in 2013. Capacity in the first four months of 2014 is up 2%. On a month-to-month basis, however, Air New Zealand has sharply adjusted capacity, with capacity in the slow May and June seasons nearly a third less than in the peak December and January season. Virgin Australia has shown monthly variance but to a lower degree than Air New Zealand. Its 1.23 million seats in 2011 grew to 1.25 million in 2012 and then 1.31 million in 2013. Capacity in the first four months of 2014 is up 4.5%. Qantas' statement also says of the changes: "This mix is designed to better reflect demand for customers wanting a low fare leisure option on Jetstar while still providing a large number of premium leisure and business seats on Qantas." Further, Air New Zealand's A320 services are without a dedicated business class, allowing it to sell more economy seats if demand for its business proposition (which includes a blocked middle seat) is low. Qantas in comparison has an inflexible business class configuration, while Jetstar cannot offer a premium proposition. Qantas and Jetstar have generally been running a dual-brand strategy, but this has been largely absent across the Tasman, primarily due to Qantas' not managing its capacity. 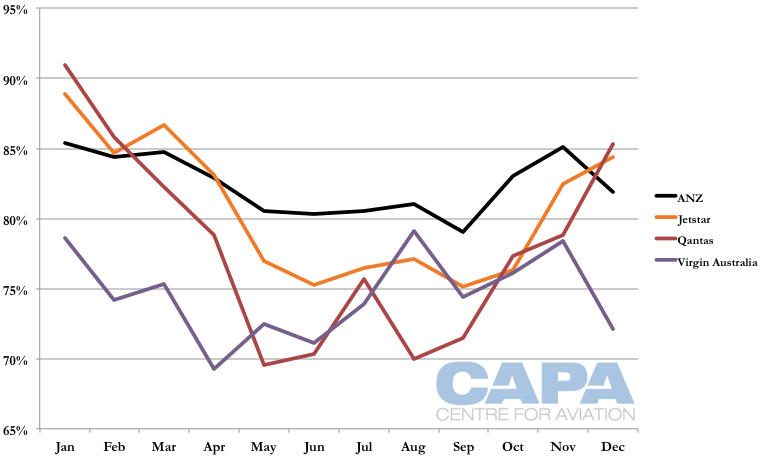 Looking only at Jetstar and Qantas' monthly capacity variation in 2013, Jetstar is adjusting its capacity while Qantas is not. The two could have applied an inverse capacity deployment strategy: when Jetstar increases capacity during holidays, Qantas could decrease due to limited travel demand in the holiday period. Likewise, during slower leisure periods Jetstar could reduce more, leaving Qantas to absorb some of the capacity. There are of course limits to this strategy given the reality of available aircraft and wanting to maximise those assets, hence Qantas is adding limited capacity during peak holiday periods. Load factors cannot necessarily give a definitive view of a market when viewed in isolation, but they can still provide some insights. Air New Zealand nearly managed a consistent 80-85% load factor throughout 2013 while Qantas dipped to 70% in low seasons. With the exception of the peak seasons in early 2013 and late 2013, Jetstar and Qantas had a lower load factor than Air New Zealand, suggesting their dual-brand strategy still needs refinement if one is to excel in certain periods. Virgin Australia had weak load factors throughout the year, suggesting its move to a full-service positioning is taking longer to realise in the trans-Tasman market, which has been leisure-focused for Virgin. Jetstar offers lower fares while Air NZ's various fare bundles can also be more attractive. Yield information is unavailable, but Air NZ is understood to have brought its short-haul network to profitability while Qantas is seeking stronger financial performance across the Tasman. The Qantas Group's changes were greeted publicly with the common negative refrain about Qantas reducing services and Jetstar growing. But once again the changes are clearly overdue, as Qantas' footprint has been too large for what it can sustainably offer in a changed world, in particular in the intensively competitive Tasman market. While Qantas pioneered a dual-brand strategy in response to changes during the last decade, it is evident that across the Tasman – and elsewhere in the network – futher integration and refinement still remains to be done. Often this needs to start with Qantas changing. Qantas may also need to consider if its one-size-fits-all premium model is sustainable. Air NZ is showing apparent success with a flexible cabin while in the Australian east-west transcontinental market high frequencies have resulted in a flood of capacity. On the other side of the Pacific, American Airlines is now offering high-frequency, low-capacity service in its transcontinental markets. As Qantas plans for the future, it has much to clean up of its legacy past. In the peak season Qantas will reduce weekly flights by three while during the low season Qantas will reduce weekly flights by 15. Some of this demand will be taken up by Jetstar, which will add upwards of seven new services. However, Jetstar will exit the Adelaide-Auckland market, which it served three times a week.